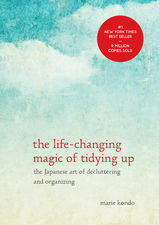 Misty and Lisa review the #1 New York Times Bestseller The Life-Changing Magic of Tidying Up: The Japanese Art of Decluttering and Organizing by Marie Kondo! If you'd like to read the book, you can buy it here. Marie's website can be found here. You can also catch Marie changing peoples' lives on her new show Tidying Up on Netflix! And don't forget to subscribe, rate, and review Go Help Yourself! It's the best way to help people find our show! Oh, and you can contact us! We'd love to hear from you.